Question: What does it mean to work on myself in order to love the friends? Answer: You need to imagine that the friend is an important person, nice and special. Otherwise, why should you love him? First, you must find a reason. What can be a reason to love the other if you hate him? To be honest, it isn’t even indifference, but actual hate. You can check the following: Imagine that your friend has won a million dollars in the lottery. The very next day, you feel differently about him. You will envy him and hate him even more. Isn’t that so? What does it mean that you hate him? It means that you prefer that he didn’t win, and that is already enough. It is very simple to check this since you would think differently about your son. So, can we work in order to love the friend if you hate everyone in the world except yourself? Now, you wake up to a sublime goal called “the Creator,” and you want to attain it. It makes no difference that you don’t know who the Creator is. You yearn for higher knowledge and power in order to climb up to the summit that is more sublime than this entire life. It is just an egoistic desire. However, in order to rise to the summit, you must fulfill a condition: to love the one you hate. The Creator gradually explains to you that you cannot love Him because if he is revealed a little, you will hate Him since your nature is opposite to His. This contrast will evoke repulsion and hate in you. So, in order to avoid such bad relations with the Creator, you have to learn to improve yourself in a different state for the time being. You are given this world: the still, the vegetative, the animate nature, and people, so try to get along with them. The Creator tells you that He will help you the more you try to love the other above the hate you feel. Now, you disrespect everyone: “Let them burn to ashes,” but the Creator has made you feel that on purpose. The moment you want to ascend above your hate, He will help you so that you will manage to do so. Just try and He will help you. Thus, together, you will switch your previous nature to another nature. The second nature will not annul the first, but you will make yourself an attire, a form just like the Creator, and will become like Him. You will be able to get to know the Creator. Then, you will be able to embrace, to connect, and to merge into one body. This is why He has created the environment that you hate, and the moment you try to love it, He will make your efforts successful. If you manage to reach the slightest achievement, not even love but at least cause less damage to others, meaning you neutralize your ego, He will be revealed. It’s because then you will not harm Him either, and you will be able to get closer and to connect. Question: You have said that while reading The Book of Zohar, we have to let the book operate on us. How should we do that? Answer: It is through simply reading and reading, hoping that it will influence me. It isn’t the book that I read, but a text that was written by Kabbalists who are beyond the Machsom (barrier) and not just beyond the Machsom, but in GAR (the three upper Sefirot) of the world of Atzilut. I connect to them through these letters. My desire to receive, my mind and my heart somehow establish a connection with their heart and mind. Their heart and mind are already in adhesion with the Creator. Thus, with the help of the book, I connect to the upper force. Now, everything depends on what I want from it. I may want to make money in the stock market thanks to its special quality, or to improve my health, or to get some other benefit so that I will feel good. If I want that “my actions be like the deeds of the forefathers,” this is actually the desirable intention. Once, people used to live in tribes in ancient Babylon, and then they split up and dispersed in different directions and different nations that are corporeally connected, they were created by their corporeal desires. In those days, Abraham collected about four or five thousand people out of several millions that made up humanity during the Babylonian age. Those who joined Abraham were people in whom the spark that yearned for something else was burning, the spark that evokes people to ascend above nature. They followed him with great hopes and expectations of finding the Creator. They received from Abraham the method for the revelation of the Creator that allows a person to learn to love others in order to attain the love of the Creator thanks to this. This group left Babylon even before the great dispersion and over time became the nation of Israel. First, the sparks were not united and everyone had different desires and could not unite. However, Abraham began working with them and uniting them by a common idea and one goal, a perception that is above the egoistic desire. He operated according to the principle that “Love covers all transgressions.” However, people can feel love only if the desire for pleasure grows in them. They acquire a sufficient power of rejection when they overcome it and ascend to love. Otherwise, the uncaring and alienation between them can extinguish any spark. It is the same group. No matter in which tent it dwells, what it studies, and in what it engages, its current state is simply called “Egypt.” “Pharaoh” appears between the friends, mutual hate, and the Torah, the method by which Joseph sustains the group, and later on, Moses. Finally, the “study group” reaches an unbearable state because the ego simply tears them apart and they don’t know what to do with it. They really want to connect and to establish the mutual connection between them, but the ego separates them so much that they reach a dead end. Then, they not only understand, but also enter a new state of the essential and vital need to escape from the “king of Egypt,” to exit self-love and transcend it. However, escape is not enough. How should we unite now? We still must coexist with the ego. In this state, the children of Israel stand before “Mt. Sinai,” not above hate, but rather, around it. Then, the Light comes, and thanks to it, they acquire the understanding of how to unite correctly, which means to use and to what extent to use the hatred in order to unite above it. They begin to work mutually in different ways, and it is impossible to do so without incorporating the negative force. In order to receive the positive force, they make a covenant with each other, and between them and the Light, the Creator. Thus, their self-correction begins. The group is the same group, but from now on it is a nation since now they really are united just like any other nation, but they are united in a collective desire, in sparks of bestowal. The basis of their unity is not the ordinary corporeal desire for a good life in this world, but the necessity to live in the Creator, in the upper. In fact, the children of Israel also are attracted to the “good life,” but behind these words, there is already a different meaning. The term of what actually is “good” changes. Question: I understand that we have to love the friend but how do I feel it in my heart? Answer: If you don’t think about the Light that Reforms while making efforts, if you don’t expect to receive it as a result of all your plans and actions, but rather hope to correct yourselves by these actions, it’s a fatal mistake. Some of the friends in the group of ten are in a state of ascent and others are going through hard times and descents and have an additional Aviut (coarseness). We are not responsible for these states, and so whether I like it or not, I simply have to take advantage of every state in order to advance. All the states come from Above and we mustn’t criticize them, and no matter whether we feel them as good or bad, we have to use them all as a means to advance. Every group of ten is one cell, since it can generate only one unit of bestowal. One person in a group of ten or two or three people don’t count. Only if all the group of ten is connected correctly does it become one unit of bestowal, and then it begins to reveal its first Light of Nefesh. Question: Why isn’t a prayer for self-correction effective? Answer: It is only a prayer of many that works. A prayer for oneself is needed so that a person will finally understand that it doesn’t help and that it is ineffective. This world confuses us since people who think about themselves succeed. A person starts a business, engages in sports, and the more efforts he makes, the greater his success. This is a real fact. However, spirituality is opposite from corporeality. The more I think about myself and do certain exercises, the more it proves that I cannot succeed this way. The laws that operate in spirituality are opposite from all the laws of this world: It isn’t the wise one who succeeds thanks to his wisdom, and it isn’t the brave one who succeeds thanks to his bravery. Whereas these qualities are very helpful in our world: The more power, brains, or money you have, the more successful you are. This world is based on egoistic bravery. However, in the spiritual world it is the opposite, and everything depends on how much I exit myself and remain powerless, brainless, and totally unable to succeed by myself, but only by investing in others, subduing myself before them, and being influenced by them. Thus, I teach myself that this is the way to advance. It is a very delicate issue. We work in the integral system, and only through my connection to everyone else—to the extent that I can attribute myself to them—can I succeed. I never will be able to exit my “circle” and to be aloof with regard to the others, and I don’t want that! Advancement indicates a greater penetration into the group in order to be equal to everyone else. It is actually opposite to the laws of this world. So, all the rules we read about in Kabbalistic texts are not just good advice and suggestions of a concerned granny to a child trying to persuade him not to jump around, not to fight, and to sit quietly. Rather, these are iron-clad rules of the upper system. We have to forget all the habitual egoistic systems and try to get used to and accept the laws of the upper system where everything goes through the group, through the “ten,” only through the environment. You will attain everything, but the means, the rules for success, are different from the ones that are accepted in this world. Your success depends only on you to the extent that you subdue yourself before the environment, your wanting to bestow everything upon the friends, to worry about them, and to love them like the people who are dearest to you and most beloved. Even if you don’t feel that, you force yourself to act that way, as if each of them is a great person, the greatest of our generation, the one who is closest and dearest to you, even more than yourself. Soon, you actually will feel that this is so and everyone will become very important and dear to you: his state, his health, and his success. You will understand and feel that you depend on this and will have no other worries except for their well-being and health. Question: What does “the ascent of the lower to the upper” mean? Answer: The ascent to the upper depends on how much the lower can annul himself before the upper. He does it, of course, thanks to the Light that Reforms and not because of inner manipulations. He only has a clue that the Creator brings him to the right environment, to the good fate and tells him “take it!” If you manage to hold on to that point and to start working with it, you will succeed. The ascent depends on what you consider an ascent. If you think positively about one of the friends at least once a day, unlike you have thought about him before, it’s already a great joy, since it indicates a qualitative inner change in you. You should worry that each of the ten friends in the group of ten will constantly aspire for such an ascent, and this is the mutual support and mutual guarantee. If you worry that all the friends should feel the same way and worry about one another, then your concern is conveyed to them. This is easy for some of the friends and more difficult for others, and so we complement one another when we gather and connect. Those who find it difficult because of the hardening of the ego add power of Aviut (thickness) to the group of ten. Those who feel the ascent, which means the influence of the Light, pass this Light to the group. The “shattering” of the vessel allows us to do this. I cannot draw the Light in my current shattered state since there is no connection between us. But I connect with the friends into one unity in which one adds the power of the coarse egoistic desire and another adds the spiritual ascent. One pulls upward and another downward, but we are connected. Those who pull upward are influenced by the Light that Reforms and thanks to the fact that we are connected in one system, they also influence me. How is that possible? The point is that we have shattered the Machsom (barrier) between us, in our relationship we have worked and made efforts to overcome the gap between us. 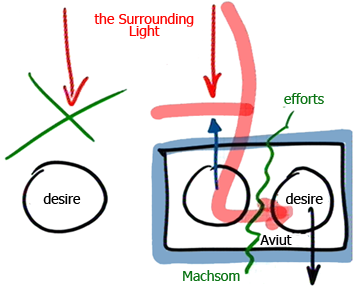 It’s as if we have placed a Masach (screen) over the egoistic receiving of the Light and now it can influence us. The Light influences those who deserve it since they are in a state of ascent at the moment and through them it affects me. Even if we are not as close as we were before and not connected as strongly into one as we were, we have made a covenant and agreed that we will hold on to the connection between us as strongly as we can and will break down the wall between us. It turns out that the shattering is simply a gift from Above; it’s a stick that we constantly have to kiss. It allows us to be constantly connected to others and to be in contact with the Light even in the worst state. If I lose contact with the others, there is the covenant by which I stay in contact thanks to those who are in a state of ascent and can draw the Light. Thus everyone operates with regard to the others. This special connection of the shattered desires is called “this world.” It’s not what we see and feel at all, it’s not our corporeal ego, but a system, special conditions that allow us to connect to the upper. Although we don’t deserve anything judging by our state, we still accept this connection: either according to the conditions of the covenant between the friends, thanks to our connection, or thanks to the mutual support. The friends may lack the willpower and I add it to them by my descent, and they help me convey my deficiency and hold on, just like healthy people treat those who are ill. The mutual help that we provide for one another, this shattered state, all these conditions are called “this world,” thanks to which we contact the Light that Reforms. So the advice and guidance of Kabbalists are focused on one point: How to connect to the Light in a state of detachment. Baal HaSulam, “The Arvut“(Mutual Guarantee): The purpose of Creation lies on the shoulders of the whole of the human race, black, white, or yellow, without any essential difference. But because of the descent of human nature to the lowest degree, which is the self-love that unrestrictedly rules over all of humanity, there was no way to negotiate with them and persuade them to agree to take upon themselves, even as an empty promise, to exit their narrow world into the wide spaces of the love of others. The exception was the Israeli nation because they were enslaved in the savage kingdom of Egypt four hundred years in horrible torments. All of humanity clearly has to reach the end of correction, and no one can escape this. But the process is gradual. We begin from easy discernments, and then by using them, we move on to the correction of more difficult discernments. The easiest part is called “Israel” and it seems to “hasten time.” Only now in the point of transition between the 20th century and the 21st century has humanity reached the eruption of the ego that is becoming round. On the other hand, Israel has preceded this process and reached the level of the great “ego” back during the exile in Egypt. Then they fell from the level they had attained and eventually descended to the last exile that has lasted until our times. The current ego is much greater than the ego in Egypt. In addition to that, it has become round, it has become global, and is similar to the form we will have to enlist on our way to the correction. 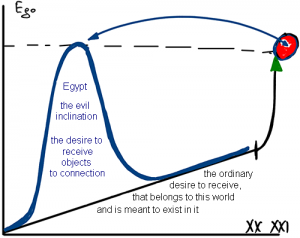 Back in Egypt, the desire to receive that opposes the connection in the general circle was revealed among the children of Israel and it doesn’t allow them to be one whole. This is the only thing that is called “the evil inclination.” It isn’t about the size of the desire but rather about its objection to connection. But the rest of humanity has developed on the basis of the ordinary desire to receive that belongs to this world and is meant to exist in it. Now Israel, with its evil inclination, is finally ready to be in a circle. We already understand what is going on and how to correct the situation. But humanity doesn’t understand that yet since it has arrived at this circle with the help of its ordinary “linear” ego and not with the help of the evil inclination. As a result, it’s very difficult for the nation of Israel to connect. No other nation is as divided as this nation. This is how the evil inclination, which no other nation has, is revealed within it. It’s very difficult for the nation of Israel to perform the correction, although they have already been through this path. Today they only have the shattered Reshimot (reminiscences). On the other hand, the nations of the world are ready to learn about the connection that will improve their life. Because they have no shattered Reshimot they don’t object to connection and if they see that the “linear” connection will provide them with a better future, they accept it. It turns out that if Israel helps the connection of the world, their connection becomes closer. I cannot even imagine how they can start to connect without it. This also explains why an external pressure upon the nation of Israel is necessary. This pressure is already growing and it will increase and become an actual threat of annihilation. Otherwise, Israel will simply not understand what and how much is required of them and what is required of them in order to get rid of the external pressure. It’s about an essential external factor that allows them to think about correction. And one who commits one sin, which means that he cannot overcome and conquer his filthy self-love, and hence steals or does something of the sort, sentences himself and the whole world to the scale of sin. Thus we see that Kabbalists look at reality as a unified system. Of course, when a person sentences himself to the scale of merit or to the scale of sin, he sentences the whole world in the same way. His actions necessarily affect and influence all the other mechanisms and the other parts of the whole world down to the very last. Today we discover this in reality, but in fact, all the worlds including our world are a system that is interconnected. So we have to acknowledge the responsibility for making the right choice, for sentencing myself to the scale of merit, in the dimensions of the whole system. I have to understand what I am responsible for right now, when I worry about the correction. I have to double my concern according to how I imagine the general picture. This is because with the disclosure of the filth of self-love…, a person subtracts a certain amount from the sentencing to the final scale of merit. This is similar to a person removing from the scale that single sesame seed his friend had put there… Because he could not overcome his petty lust, he pushed the spirituality of the whole world backwards. This is the system we are constantly in and the slightest movement by even one millimeter is enough to move the whole system. But there is a weakening mechanism, “filters” of concealment, or the worlds. The system is totally revealed in the world of Ein Sof (Infinity) to its full size and depth. Accordingly, whoever is there has to be responsible for the whole system, as he feels it and fully manages it, without a flaw, just like the Creator. There we are totally equal to Him, adhered to Him. On the other hand, it’s our responsibility and our obligation to enter the system integrally by understanding our mind and our feeling, which depend on the current level that is part of the levels that descend from Ein Sof. We are responsible for the system in general since it’s a qualitative characteristic and not a quantitative one, but to a lesser extent. For example, I am responsible for keeping the system “clean” and you are responsible for its “color,” and someone else for the “electricity,” another for the “air conditioning,” and so on. Thus I fulfill the uniqueness of my soul, since without me no one will make up the part I have to fulfill when I operate the system in my own unique style. Without me it will not reach wholeness, since it is integral by nature. So every level increases my responsibility: It’s as if I replace the Creator in different aspects, and when I begin to understand the system I begin to understand Him, to feel Him, and to resemble Him. The system is actually the relationship between the friends. After all, there is nothing but that. We discover everything in the friends, in humanity, in the still, vegetative, and animate nature. This means that we have to discover all the parts of this world in addition to the world itself. This collection of ties is actually the spiritual worlds, mutual bestowal, the system of creation. It’s as if we put on special glasses and see all the mutual connections between all the components. But this system is revealed gradually. First in the group of ten, and then it grows wider and deeper in discernments that we couldn’t discover otherwise. First it was difficult to notice the connection between us; it was hard to discern it, but with time it’s revealed more in our understanding and feeling and in the most varied forms. Thus we connect and discover the system and the forces that operate in it that are actually the Creator who sustains this whole complex. We discover the form that He creates in the matter of the desire. He is revealed in matter and not in an abstract form and not in the essence.